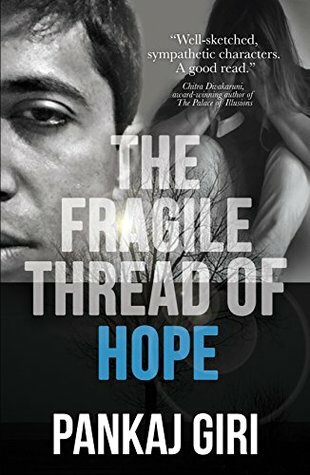 If you love contemporary literary fiction novels by Khaled Hosseini and Jhumpa Lahiri, contemporary christian fictionnovels by Melissa Storm, and tragic romance novels by Jojo Moyes and Nicholas Sparks, then make time for Pankaj Giri’s new heartbreaking inspirational novel The Fragile Thread of Hope. This is a good book about trying to move on from a tragic past. It deals with depression and other heavy topics that will not be everyone's cup of tea. In fact, there were times that I didn't know if I wanted to continue reading. I'm glad I stuck with it because I really liked this author's writing style. The author obviously has a lot to say and I think they said it elegantly. It did take me longer than usual to get through this book because it was a downer. It was dark and depressing and it was difficult to read sometimes. I hate multiple POV's but this one was done well so I can overlook that. I liked the characters and felt like they were very realistic. I felt like there could have been a little more in the romance department but it was decent enough. All in all this was a decent book but not a book for everyone.